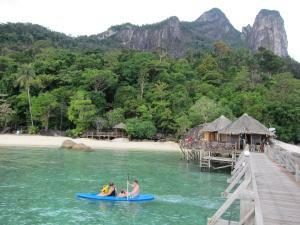 Hotels on Tioman island presented quite a large number of budget options. There are also some expensive and comfortable hotels. But, overall, the prices compared to the rest of Malaysia are considered to be very low. Although, it is necessary to warn that this apparent cheapness is a very low quality hotels and bad service. For all its ultra-low prices, quality of accommodation on Tioman island is also very low. For $ 20, but don't count on a room with air conditioning and hot water. More or less decent room with air conditioning at the venue will cost $ 30. Искать больше отелей на Тиомане';photo=''; if (photo_url) photo="
Most of the hotels and infrastructure located on the Western coast of the island and in its Northern part. The most developed and popular village, Tekek, Salang and Air Batang. Most of the budget accommodation options can be found in the villages on the Western coast of the island: Salang, Tekek and Air Batang. Here you can always find a bed in a Dorm of 20 ringgit, the hotel room from $ 20, Bungalow on the beach. Almost all hotels are in close proximity to the beaches. As for budget accommodation (from 10 to 30 dollars), booking a hotel or Guesthouse in advance no special needs and you can always find availability on the spot. If you are not too picky about the quality of accommodation, and most important for you – it would be a place to stay, feel free to go to the island and find a place to stay at any time of the year. If you want to stay in one of the most popular and expensive hotels of the island (from 30 to 100 dollars), it is recommended to book in advance, even better in a few months. It should be borne in mind that during the rainy season, roughly from November to February, many hotels and guesthouses are closed. Yes, and you there at the time nothing special to do. Also keep in mind that in high season (summer) on weekends and an influx of local tourists, and it is not always possible to find free places in hotels (not easy, but not impossible). So if you arrive on the island in a weekend, better to book a hotel. In the offered on our website the search of hotels from Agoda only shows a small number of the most popular hotels of Tioman island, some of which are available for booking no earlier than six months ahead. When booking in advance has another advantage: on request, the hotel can arrange transfers from the airport or will provide all the necessary information on how to get to them (bus schedules on the mainland, ferries etc.). The most civilized and the most developed infrastructure of the village on the island. Here is an airport, a Marina, many shops, including duty-free, ATM, hospital, police station. The most popular hotel of the island, the Berjaya is located here. The beach and sea are excellent, have the opportunity to practice snorkeling. Tekek, along with Salanga, is one of the most popular places on the island, but the price is more expensive Salanga. Tekek village (Tekek) on the map. The village of Salang, perhaps the most popular place of the island. Here a large number of economical options for accommodation (but on the luxury apartments don't count). Good beach and excellent opportunities for snorkeling. The village of Salang on the map. Near Salango is very popular with divers Bay, Monkey Bay. One of the popular places on the island. If you want some movement and fun. Genting considered the center of entertainment on the island, although the entertainment a bit more fun than Conchas in kindergarten. So this is the island of Tioman, quiet and calm. Most of the hotels available for booking in advance using the form for searching accommodation above, located here. Village Genting on the map. The village lies on the Eastern side of the island, and reachable only by foot through the jungle or a jeep. This route, incidentally, is one of the popular trekking routes. The beach here is famous for its pristine beauty and popular with tourists, ready to experience the inconvenience of living and the difficulty of delivery here. This is a great place for solitude away from civilization. Even in the height of the season there is almost nobody there. The village of Juara on the map. In the village is a hatchery for sea turtles, created to preserve their endangered population. If you love animals, you can even stay overnight in the nursery and volunteer to help work with the turtles, but during the night you will have to pay. In Juara there are three rivers and the path to get to the location in the jungle waterfalls. The three-kilometer long beach of Melina stretched between the village and the beach Renting of Paya (Paya Beach). Here is the hotel Melina Beach Resort, which bills itself as a hotel for lovers of ecotourism. The hotel is fairly new (since 1999), and it was really straight from the bungalows you can observe the wildlife, and the pristine beach is almost at the beach to do snorkeling. The hotel is isolated and removed from the infrastructure, but everything you need for a quiet secluded relaxation, the hotel represented. A review on the forum about the beach and the hotel Melina. Afraid to answer to this question will be difficult because it's depends on the choice of transport and accommodation. We tried to choose the conditions in which it is possible to live with children. The only thing I can say that for us this journey has cost more than in Thailand (Samui) percent of 25%. Both trips we were preparing ourselves, without any agencies. Here is a web site for example Bergii http://www.berjayahotel.com choose in the drop-down window Berjaya Tioman and see the prices. In addition, there are on www.agoda.com several Tymanski hotels. Take a look and choose. by the way on the website Melina was. exhibited. You can calculate yourself. Generally, if you talk about food in the whole of Malaysia, they have their meals one-two and obchelsya, all fried with rice. Someone seems to have wrote. Often we come across Chinese, Thai and Indian food, and of course American fast food chains. And Thai an order of magnitude worse than in Thailand itself. Oh, and about Tioman - there is no fruit, all imported, so quite expensive. We had to drink mainly fruit juice (delicious) and we bought them or to Paya or Tekek. In hotels all several times more expensive. And tell us about the sights. What is there to see? I usually always aimed at the inspection of something interesting away from the beaches, and in places like Tioman island, on the Islands, never been there.